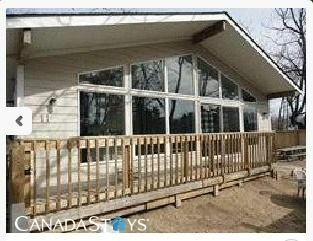 Fantastic location in the heart of Wasaga minutes to beach One! This new, immaculate, three bedroom chalet-style cottage is 50 yards from the Beach. Sleeps 11 people comfortably. Great place for your after prom or graduation celebration. Spacious area and perfect for families. This cottage is a stones throw from the white sand beaches of Georgian Bay. Near Wasaga's best dining and entertainment. Collingwood and Blue Mountain are only a 15 minute drive away. Our location is a 10 minute walk to the energy and nightlife ofthe strip,LCBO, Beer Store, Giant Tiger, Convenience Store, ice cream shop, mini golf & much more. A Provincial Park is located across the street. Parking for 2 - 3 cars (depending on size of vehicles). Please contact us for stays shorter than a week or weekend. We rented this place for this past long weekend, Pat was extremely accommodating, the place was exactly as described and literally 5 minutes walk to the beach. Thanks again Pat for the great experience, we will definitely be back! Our stay was great. Glad we brought extra fans. It was a little hot the first few days. Family enjoyed themselves. Would go again. Pat was great with any need that came up. Alcove by the Beach is a really nice cottage that is just a few minutes walk from Beach 2. The cottage looks exactly as how it does in the pictures. I would definitely recommend this place to other people. Sandy back yard, bed frame, mattress, propane barbecue need a good maintenance. I wish they can provide some fans since there is no air condition facility to the cottage in summer.